2nd Edition Revised and Updated (Now Shipping) If you are not sure you are loading your quilt correctly, get scoops in the backing, have questions about needles, thread, batting, need help setting up a panto, have trouble adjusting the tension, want instructions on setting the timing, or more, this “Guide” is for you. We wrote the book for Nolting! 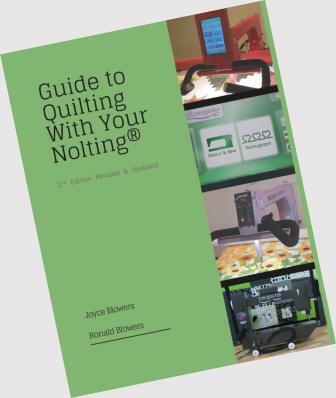 Written by Nolting Dealer, Joyce Blowers and her husband Ron, Guide to Quilting with your Nolting, 2nd Edition is comprehensive, filled with information, tips, and resources on how to use, maintain, troubleshoot, and truly enjoy your Nolting Longarm. The 2nd Edition of the “Guide” (November 2018) has been revised and updated with even more. New in this edition: • More information on using the NV model released in 2016 • More information on Quiltmagine and computer guided quilting options • Specific tools needed for each type of maintenance, adjustment, or repair • Tool Box - Master Tool List • Ten Steps to Perfect Tension • Understanding Nolting Controllers - updated with info for quick identification of your machine. Especially helpful for older machines and when calling Nolting for help. “Thank you Joyce for making this book! WOW so much valuable information! Connie J. “As a retired Instructional Designer for training materials, I appreciate well written instructional material. Wish I had it a lot sooner.” Sandi D.
2nd Edition - Revised and Updated (Now Shipping) If you are not sure you are loading your quilt correctly, get scoops in the backing, have questions about needles, thread, batting, need help setting up a panto, have trouble adjusting the tension, want instructions on setting the timing, or more, this “Guide” is for you. We wrote the book for Nolting! Written by Nolting Dealer, Joyce Blowers and her husband Ron, Guide to Quilting with your Nolting, 2nd Edition is comprehensive, filled with information, tips, and resources on how to use, maintain, troubleshoot, and truly enjoy your Nolting Longarm. The 2nd Edition of the “Guide” (November 2018) has been revised and updated with even more. New in this edition: • More information on using the NV model released in 2016 • More information on Quiltmagine and computer guided quilting options • Specific tools needed for each type of maintenance, adjustment, or repair • Tool Box - Master Tool List • Ten Steps to Perfect Tension • Understanding Nolting Controllers - updated with info for quick identification of your machine. Especially helpful for older machines and when calling Nolting for help. What quilters are saying about “Guide to Quilting with Your Nolting.